Transurethral operation techniques require extensive training. A practice phantom can support the learning process to a great extent. 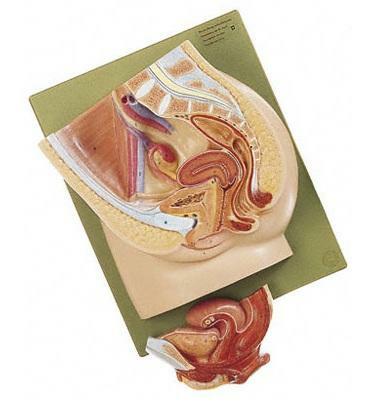 This model comprises a natural size trunk, made of special plastic with interchangeable genitalia, on a base with a water tray: male genitalia with urethra and interchangeable prostate and connection to the bladder; external female genitalia with urethra and connection to the bladder. The prostate capsule can be filled with natural or synthetic materials. The bladder is split and joined together with a sealing ring. The bladder incorporates 4 openings: the front connection to either the prostate or urethra; the top to take a bladder trocar or for drainage; the back wall for providing tissue, if necessary, for measuring pressure or the insertion of electrodes; an opening for the plug connector for draining the contents of the bladder with the pertinent shut-off and drain hose. All endoscopic operations can be practised on the phantom using ultrasound or lasers. The phantom is also suitable for various experimental examinations. For example, testing and assessing new methods in high frequency technology, pressure and flow measurements, testing new instruments etc. H28 cm, W45 cm, D36 cm, Wt 6.3 kg.